"Disappointing. Doesn't Live Up to it's Purpose or Title"
Low price. Some tidbits of good advice in sections 4 and 6. Product neither provides good in depth advice on general dating (attracting women, connecting with women) or specific texting. Some 'bad and dated advice' that will have a negative impact on your success with women. Some grammar and spelling mistakes in text examples won't help you. The ultimate texting guide doesn't hit the spot. It is really cheap at under $15, but that isn't going to help you. It packages a lot of generic, and sometimes dated, dating advice. However it doesn't really offer much pure advice on texting. If you want to learn about general dating advice, buy one of the well rated general dating advice products I linked to in the full review below. If you want to learn about texting specifically, I have recently reviewed another book that really impressed me. This one is very comprehensive and contains a lot of quality AND original content (as of 2010): the ultimate guide to text and phone game by love systems. Tyler Tray's Ultimate Texting Guide is disappointing for several reasons. Overall it has the feel of a product that goes little into depth in anything, which prevents you from learning anything properly. Themes and subjects are touched on lightly, then you move on to the next. As a result you are not likely to solidify very much learning from reading it. As I went through the ebook I found some advice, and example texts, which were awful. They would get the exact opposite effect of what was intended. Both reflected a needy and reactive mindset which is one of the first things you need to eliminate to get good with women. Instead of progressing with the woman you would move closer to rejection. One example of bad advice was when things are going badly to text "I can see you are still trying to get over your last boyfriend. Good luck with that." That will get you communicating some very negative reactive traits to the girl and drive her away even faster. "Time Warp": As I read Tyler Tray's Ultimate Texting Guide" I felt like I had been sucked into a time warp and dragged back to dating advice that was being used around 7 years ago. Advice has improved a lot since then and got much better. Looking at some of what was written made me shudder. I remember when I first learned a few things having applied some similar ideas way back in the day. This product takes some of the most common dating advice on attracting and connecting with women and simply refers to it in the context of texting. It doesn't introduce anything new. And more importantly, it provides very few specific insights or advice related to texting itself. It is more like a summary of principles that have been established in some of the original dating advice for men products that build dating advice to where it is today. It really came across as though Tyler Tray had read the original products and summarized some of their points in this ebook. That was 75% of the content. The point is here that as a result 75% of the books content is just a low quality version with lack of depth explanations of better stuff out there. If you want to learn about attraction or connection you should get some dating advice which covers the subject fully like The Attraction Code or the Double Your Dating ebook or more sophisticated products like Revelation or Magic Bullets. Those products will teach you the subject in enough depth for you to learn properly. This product does not. 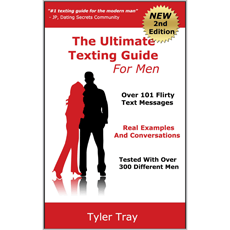 Throughout "The Ultimate Guide to Texting" Tyler Tray provides generic rules to follow as advice across all situations. The problem with this is that it lacks the sophisticated reality of interactions with women. There is no advice given on how to adapt approaches to situations or the type of girl. As a result I fear a lot of guys would apply his 'hard rules' in the wrong contexts and sometimes get awful rejections (given the type of blanket rules he applies). An example is in Section 3 where he suggests texting a girl that asks for something: "I would but your face isn't pretty enough to get that from me." Now, this can work with *some* girls. It's true. But those are specific types of girls. Other girls will be completely repelled by this type of remark, especially at the wrong time, at the wrong stage of relationship. Other examples include advice such as "Never say you miss her" and "Never laugh in a text". All this is likely to do is turn guys into 'social robots' where they aren't being real with women. There is not enough explanation provided with these suggestions to let the reader know why he should use these and they would be good ideas - that at least would've allowed him to make his own decision about where to use them. This essential information isn't given. The ebook isn't all bad. There were some good bits of advice in section 4 and section 6. The concept of 'dead air' is good, and I haven't seen it explained in that useful way elsewhere. Also 'talking in third person', and there were some good tips on what to do when you call the girl. So Tyler Tray does bring a few of his own ideas into the mix. However there is just too little of it to substantiate the product. It's around 5% of the product. Surprisingly in section 6 he gives some advice which conflicts with advice given earlier in the book. The advice in this section is better - however a reader will get confused between the two as a result. One good thing is that Tray is a least not trying to rip you off on the price. At 15 bucks, this is among the cheapest products out there and accessible to everyone. Unfortunately, if the advice is so-so at best and sometimes wrong, even 15 bucks can be too much. It's a funny product that packages a lot of generic, and sometimes dated, advice under the theme of texting. However it doesn't really offer much pure advice on texting. If you want to learn about general dating advice, buy one of the well rated general dating advice products I linked to above.